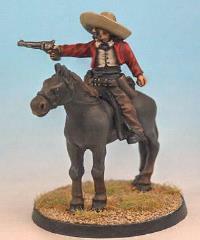 Carlos, a mounted Mexican is often seen causing trouble with a large band of Mexicans. Wanted in several towns he's renowned for his sharp shooting on the move. Base supplied.